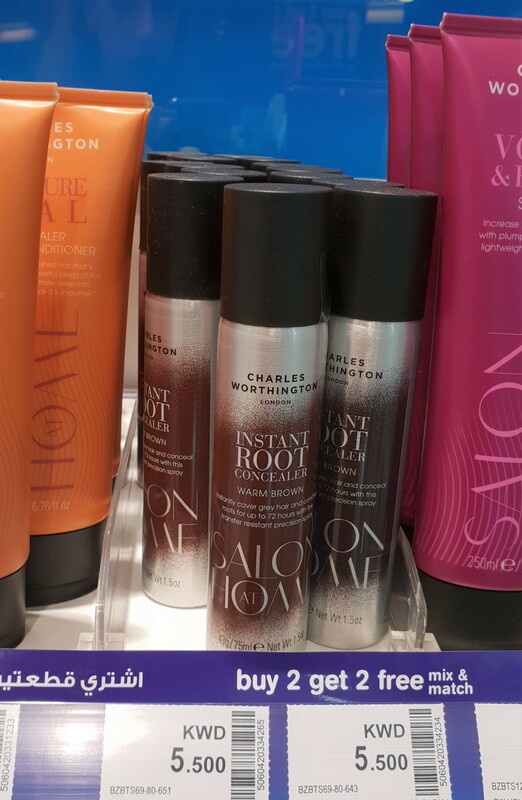 Right away I noticed a display of new Charles Worthington Hair Care Products! It included everything from Instant Root Concealer (I mean… LOL) to Micellar Shampoo (seriously) and Leave-In Conditioner. The Orange packaging is the Moisture Seal range whereas the Blue packaging is the Everyday Gentle range and the Berry Red and White Tubes in the middle were part of the Volume & Bounce range. My hair was in dire need of the stuff! I went back to blonde (photos here)… during the Summer and haven’t gone back nor dyed my hair since! As you might imagine, my roots have totally grown out (six months later lol) so I was very much interested in this stuff to “conceal” them. The sales assistant opened one up for me (there were no testers, as per uzhe) and generously sprayed the one in Warm Brown on my dark roots (it was around closing time and I was heading home right after anyway so I didn’t mind if it turned out awful). Although it wasn’t an exact match, there no longer was a stark difference between my dyed hair and my darker roots. I liked it! This version cost considerably less but after testing it out, I could see why. It was pretty bad therefore, pass. I picked it up earlier in the shade “Chestnut Highlights” which was for dark blonde to light chestnut hair (haulage here), but never got around to using it (chickened out). Despite myself, I was so tempted to pick up another one lol It’s like I never learn. Oooh! These were definitely new to Boots! I’ve only seen/heard of Co Lab online so I was pretty stoked that we finally got them in Kuwait! They had the scents Fresh and Fruity and Candy and Tropical and Exotic and Good Vibes and the slightly more expensive Active (again, I blame Clinique for this “trend”). Initially, I was drawn to Fruity because of the ridiculously adorable packaging, but the scent didn’t do it for me. I wasn’t interested in anything because Soap & Glory products are usually hit or miss (mostly miss) for me. Also, I really can’t stand their main scent (Pink) which I find to be too floral. I’ve actually written up a rather lengthy and somewhat unflattering post that includes many of their products that I’ve already tried (review here). I did however decide to give the brand another shot and picked up one of their previous Gift Sets (haulage here), but didn’t fall in love with anything. 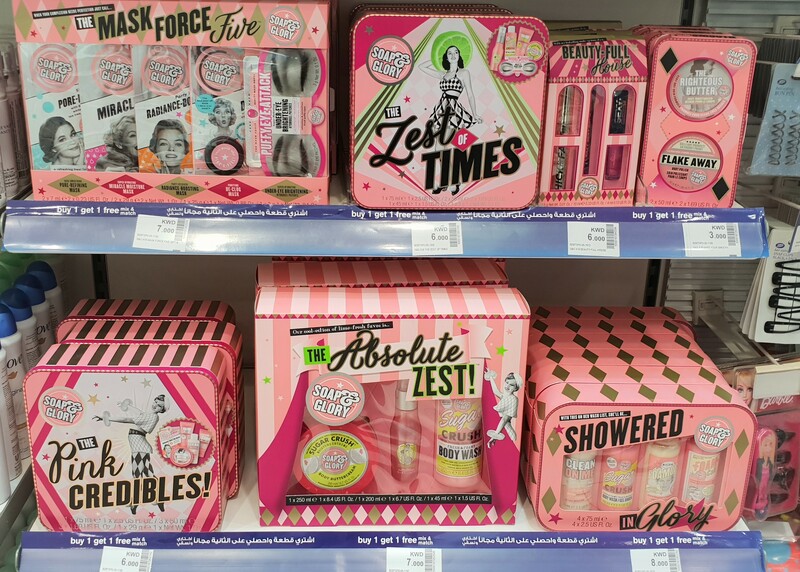 As such, I’ve learned to be more selective when it comes to Soap & Glory, only purchasing individual items that catch my interest (haulage here) as opposed to Gift Sets or Value Sets that would definitely contain several items I wouldn’t enjoy. In any case, they tend to release many, many of these Gift Sets and Value Sets before the Holidays, which is ideal for those who actually enjoy using products from Soap & Glory because you can also use the smaller items as Stocking Stuffers, or gift the entire Gift Set, or buy it for yourself (and get a chance to try out products you normally wouldn’t)! How stinkin’ cuuute! Forget tweens, I wanted this! I’ve thought these Tangle Angel Brushes and their smaller version the Tangle Cherub Brushes (even the names are too cute, Angel for the bigger size and Cherub for the smaller brushes lol) were adorable to begin with, but when I saw this in the gorgeous “oil slick” iridescent shade, I was obsessed! Obviously, the promo didn’t apply to them (typical Kuwait) so I decided to get it at a later date (preferably once it went on sale). Unfortunately, during my next visit to Boots, these babies were gone. Ah well, you snooze, you lose. My favorite will always be the Zingy Lime Fizz Shower Gel (haulage here) which legit smells like Skittles! However, it’s nice to see them bringing newer scents to the range! They had Zingy Black Peppercorn and Refreshing Eucalyptus Oil and Invigorating Caffeine & Ginger and so many more! If I didn’t already have like, a hundred Shower Gels from Bath & Body Works, I totally would’ve picked up the Caffeine & Ginger. Oooh! Kinda’ resembles the Johnson’s Rose Water Collection (spotted on Halloween at Sultan Center here). Between Johnson’s and Nivea and Bath & Body Works (spotted here) and such, it’s all comin’ up roses (well… rose water, rather). I’m very, very, very bad about using Sun Protection (I just don’t do it). That said, I’ve had my heart set on the infamous Shiseido one (that comes in the iconic tiny bright blue packaging) since forever now! I’ve actually been searching for it for years (everywhere from all the Makeup Stores to the Perfume & Makeup Exhibition). I recently did find it at Sephora. However, it occurred to me that it was probably going to be expensive (I didn’t ask how much) and they were probably going to give me something that’s close to expiring if not already expired and therefore not potent at all. Basically, I wanted my money’s worth. Also, what if I bought it, but never used it? I figure I should try out something cheaper first (hence the photo above) and see if I’m diligent about applying it, before springing for the foncy foncy version. Everything was all PA+++++++++++++++++++++++ (why all the +’s and what did they mean?) and there was UVA and UVB and Broad Spectrum. It was like a whole new different language to contend with. It was all very confusing so I lost interest lol and didn’t buy any of them. So if you don’t know, CoverGirl and Max Factor are the same brand except with different names and different packaging in different areas of the world. I remember purchasing the CoverGirl 3-in-1 Foundation (but never actually using it lol) online years ago from Drugstore.com so it’s nice to know that it’s finally gotten to Kuwait (only about 4-5 years later lol). Lastly, they were selling bags of old and moldy Rimmel products, by the entrance. The makeup items were random (it seemed like mostly all the ugly shades that didn’t sell that well) and even the plastic bags were all dirty and gross (like they’d been used for something else before this). Thanks, but no thanks.